Iris Chavez (L) and Tony Monroe shop for Halloween costumes at Fantasy Costumes on Oct. 28, 2014, in Chicago. 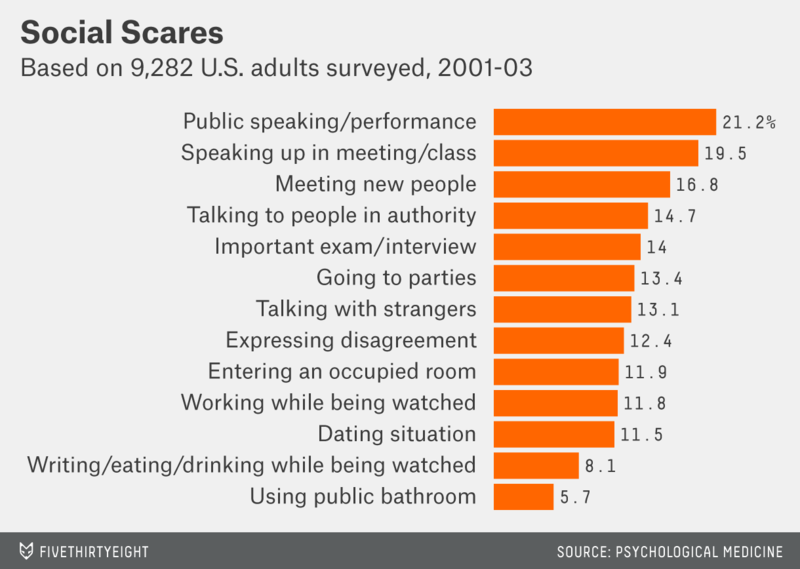 If you really want to scare someone this Halloween, you should think about dressing up as a microphone — 21 percent of Americans say they are afraid of “public speaking/performance.” Alternatively, you could just spend Friday evening forcing fellow partygoers to engage in conversation, since 13 percent fear talking with strangers, according to a survey of 9,282 adults cited in a 2008 study. Interestingly, when similar questions were posed by the World Health Organization in 20 countries (including the U.S.) in 2011, researchers found that the anxieties charted above were more prevalent in developed countries than in developing ones — with the exception of using a public bathroom. But it’s hard to find a costume that conveys a fear like “important exam/interview” so I looked at another study, published in 2007, which looked at objects as well as social situations. This survey was even bigger — it asked 43,093 U.S. adults about 12 “specific phobias” as defined by the Diagnostic and Statistical Manual of Mental Disorders. Respondents were asked if they felt nervous, frightened or tried to avoid any of the items listed, when they thought about or were confronted with the items. The most commonly reported phobia was “insects, snakes, birds or other animals” (a phobia for 4.7 percent of respondents) followed by “heights: e.g. tall buildings, bridges or mountains” (reported by 4.5 percent). It’s also worth noting that there can be overlap — most respondents who reported one phobia also listed a second, third or more from the list. 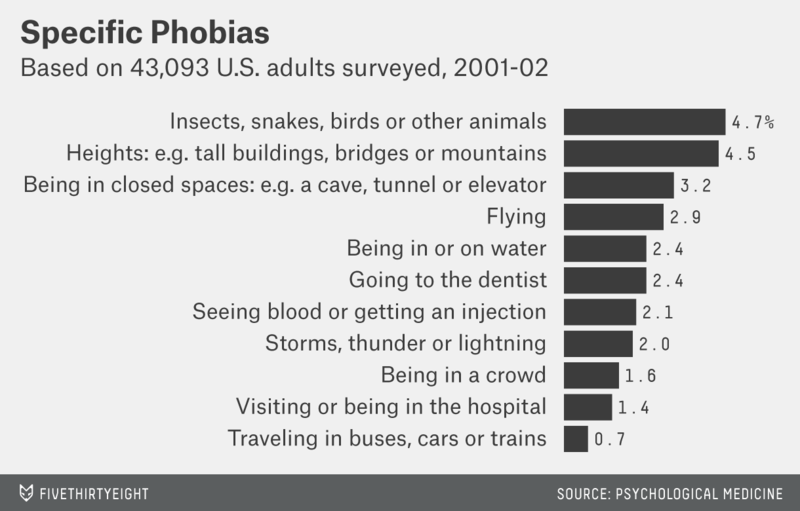 These are phobias, a type of anxiety disorder, which the American Psychological Association describes as “intense and irrational fear,” so the reported percentages are far lower than the fears described in the first chart above. It also means that while dressing up as a cockroach dentist would be a highly effective Halloween costume, it could also be an extremely cruel one. A YouGov poll from March of 989 adults’ fears offers some more reasonable costume choices. Snakes, spiders and mice all frighten Americans, especially women, who were more likely to report a fear of every item listed (perhaps because they are more willing to admit feeling fearful). This all suggests that people are choosing their Halloween costumes very badly if their aim is to scare others. As Quoctrung Bui at NPR shows, for the past five years “witches” have been the most popular adult Halloween costume. True, none of the surveys mentioned here asked adults if they were frightened of witches (or pirates, or vampires, for that matter) but clowns do come up. The 11th-most popular Halloween costume in 2011 was feared by just 13 percent of respondents in the YouGov survey — after dogs, blood and darkness. So before you do the clichéd messy lipstick and wig routine this Friday, remember the data suggests you’re more slapstick than scary.